My Lisbon adventure came about in an interesting way....During my first semester abroad I traveled a lot with a few friends to places like Spain, Germany, Italy, France, Ireland and The Netherlands. Each of those trips were so special, but I was starting to feel like I was getting way too comfortable traveling with others and relying on them during the experiences. So, I made the hasty (but amazing) decision to book my first.ever.solo.trip. This post is special because everything on the itinerary was done on my own. I was a 20-year-old who went out on a limb and traveled from England to Portugal for a solo adventure. If you're at a crossroads in your life or just want to try something sporadic for once, Lisbon is the place to go! I loved Lisbon so much, I returned once more before I left for home in December. Yes, I loved it that much. The reason Lisbon popped into my head was because I worked for a Portuguese family the summer before leaving for abroad. They encouraged me to consider visiting and I'm so glad they did! A lot of people say Portugal is like an underrated version of Spain. It's incredibly inexpensive, has beautiful weather, and has a super vibrant culture. The entire time I was traveling to Lisbon I kept doubting my decision. Granted, the trip was a total of four days, so I wasn't leaving for a month, but still! Going on a trip by yourself is hard. I kept wondering if I'd get lonely, want someone to talk to, or if I'd be safe. I remember getting off the plane and hopping onto the metro (which is super efficient!). It was the first time during my semester abroad that I could actually hear myself think. It was such an odd feeling, but one I became very comfortable with. As soon as I checked into my welcoming AirBnB, I felt at home and knew I made the right decision. I had no doubt in my mind that a solo trip was exactly what I needed. There are so many inexpensive AirBnB's in Lisbon. I paid $20 (yes twenty) a night for my AirBnB. I rented a room from a lovely couple who lives in the heart of Bairro Alto. If you're going to Lisbon, you must get a place in Bairro Alto. It's the heart of the city. There are great restaurants and bars in the neighborhood too. The metro and trams run right through making it very easy to get anywhere. AirBnBs are 100% the way to go in Lisbon because the buildings are so beautifully decorated and it's a great deal. Here's the AirBnB I used. There are so many other cool listings as well, so make sure to shop around. Portos do Sol: This is the city's "sun gate" and gives you one of the best views. I recommend taking the traditional Tram 28 from Bairro Alto to here. There will be artists selling crafts and musicians performing. Nothing beats the view from here! 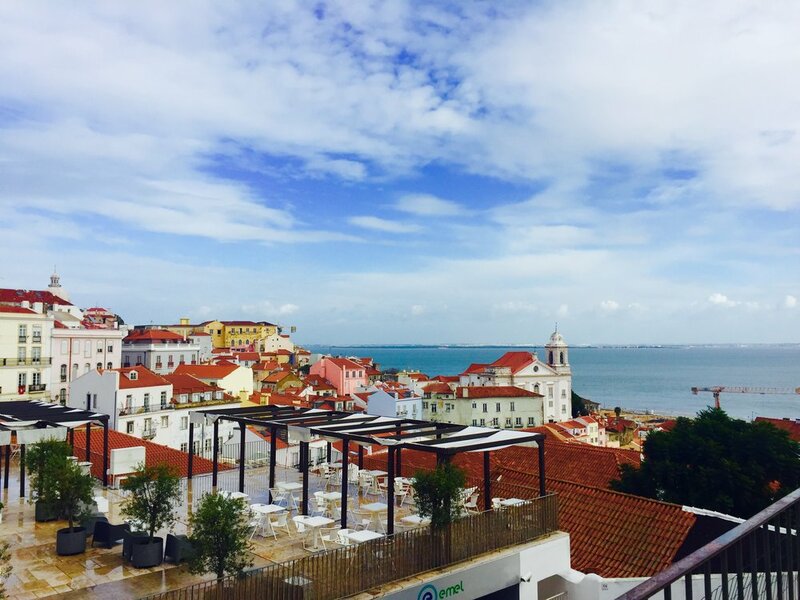 Castelo de Sao Jorge: From Portos do Sol take a walk up to the city's famous Castle. The admission ticket includes the entire ground as well as a museum. If you can be here for sunset, you won't regret it. There's convenient wine-to-go carts at the lookout parts of the Castle. Pictures couldn't do this view justice and it was the perfect spot for self-reflection. Be sure to stop by the shops outside the front gates of the Castle. There's beautiful hand painted ceramics. You can't leave Lisbon without getting an "azueljo" or blue painted ceramics. Lisbon Cathedral: I stumbled upon this beautiful cathedral on my walk down from the Castelo de Sao Jorge. It's tucked in a neighborhood, but definitely exemplifies beautiful Portuguese architecture. 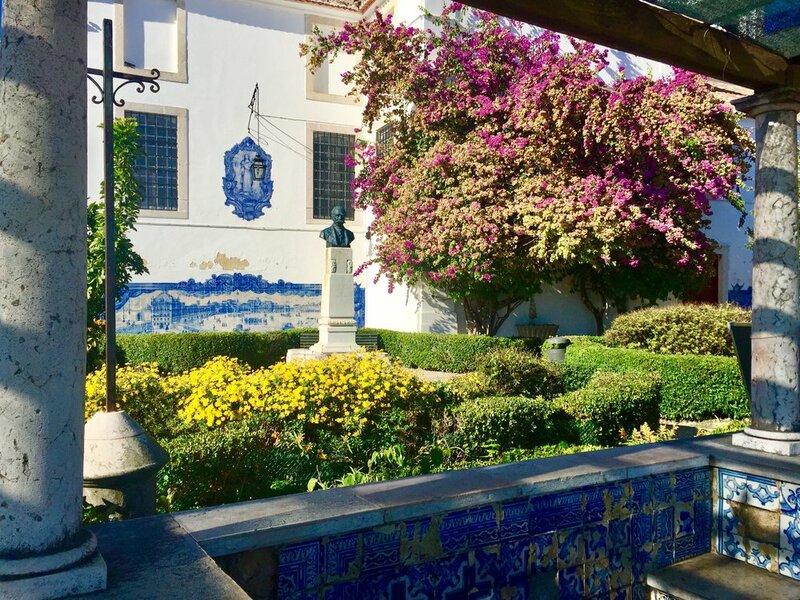 Museo Nacional do Azueljo: If you can't get enough of the beautiful blue tiles that decorate the entire city, you should make a stop at this museum. Entrance is 2.50 euros for students and it gives you a great understanding of the architectural history of the city. Mosteiro dos Jerónimos: Dating back to 1501, this gorgeous monastery took a total of 100 years to build. They definitely did a beautiful job! You'll be awe struck by the minute details of the monastery. You just can't find that kind of detail in America. I recommend buying a joint ticket for the Monastery and Tower of Belém (Torre de Belém). Booking online beforehand isn't required. Museo Coleccao Berardo: Just a two minute walk across the street from the Monastery, is this wonderful modern art museum. I'm typically not a fan of modern art, but I was blown away by the creativity of the work here. Plus it's free! Torre de Belém: I remember being a bit confused after leaving the Museum and trying to find the tower. There's a highway that separates the road that the Museum and the Tower. They've conveniently built both an underpass and bridge to help pedestrians safely get to the other side. Just keep an eye out for them. The waterfront walk can be lengthy, but there are tons of cute restaurants, food trucks, and markets all the way down. The Tower of Belém gives you a great panoramic view and is definitely an icon of the city. If you have one last day, you must do a Lisbon Walker tour. It's a free tour that I found in my Lonely Planet guide book. I'm so glad I gave the tour a chance, because it was the highlight of my trip. You meet at the Rua Augusta Arch where you'll find a guide in an orange t-shirt. The others on the trip were also solo travelers from all around the world (Italy, the Netherlands, France). I had visited those countries just a few weekends before and couldn't contain my excitement. It was wonderful to talk to them about my experiences and hear about their trips. I wouldn't have opened up to total strangers unless I was solo traveling. I was also so impressed by all the details from the tour. I had walked passed most of the points on the tour but had no idea what any of the buildings were used for or the meaning behind anything. I recommend Lisbon Walker and be sure to leave a tip at the end, especially if the guide did a great job. A Margem: This is a waterside restaurant located near Torre de Belém. I had the most relaxing time eating there with the best view. The Decadente: This is definitely not a traditional Portuguese restaurant, but I loved the cozy vibe and the food was delicious! It's a short walk from the center of Bairro Alto. Pastéis de Belém: Portugal is famous for their dessert called pastel de nata. This bakery is the most famous in the city. You'll often see locals and tourists alike walking out of the stores with huge bags filled. There are other smaller bakeries around the city that sell them, but if you're visiting the Tower and the Monastery, it's just a short walk away and definitely worth the stop. Luckily transportation in Lisbon is a breeze! I took trams and metros every day. I recommend getting a multi-day pass that includes all forms of transportation. The hills of Lisbon will definitely tire you out regardless of your fitness level. By the end of the day, you'll be wanting to hop on a tram, so having that multi-day pass is well worth the money. Always be careful of pickpockets on the trams, but especially Tram 28 because it's a tourist attraction and they will totally target you. I became so much more comfortable being on my own. I learned to trust my decisions and that I'm much stronger than I thought I was. As much as I love traveling with friends, sometimes its totally necessary to go on a solo trip to have that much needed alone time adventure. If you're hesitant or want other recommendations to cities that I would solo travel to, I'd be happy to help you out! Once you do one solo trip, you'll get hooked.